Following the success of the original RGBW and WW models, the ADJ Saber Spot range is expanding with the addition of the Saber Spot DTW. Featuring the same combination of potent light-source and compact casing that have made the other units so popular, the new model offers a wider beam angle as well as an innovative ‘dim to warm’ effect that emulates the dimming profile of traditional halogen lamps. Powered by a single, flicker-free 15-Watt warm white LED, the Saber Spot DTW features a built-in ACL (Advanced Collimator optic Lens) that produces a tight 20-degree beam of light. This makes the fixture suitable for table-spotting, retail displays and illuminating performance stages. Despite its powerful output, the unit is extremely compact, which makes it ideal for use in venues with low ceilings or other situations where space is limited. The LED produces an output of 726 LUX (measured at 3M) and has a color temperature of 3100K. However, a second LED element is also built in to the light-source, which is less bright than the primary LED, and has a 1900K (amber) color temperature. Using the fixture’s pioneering ‘dim to warm’ feature this secondary LED element is introduced at the lower dimming settings, which creates the appearance of the incandescent glow associated with halogen lamps as they are turned on and off. The Saber Spot DTW is therefore ideal for any situation where you want to achieve the authentic feel of traditional filament-based lighting but with all the advantages of LED, such as low power consumption, long lamp life and low heat. Two interchangeable frost filter lenses are supplied with the fixture, allowing its beam to be diffused for situations where you require a wider and softer light source. The LED has a 10,000 hour life expectancy and offers flicker free operation (3.6KHz refresh rate), making it suitable for situations that involve video recording or live streaming. The flexible fixture also offers variable speed strobing (1 – 20Hz) as well as five selectable dimming curve options. The Saber Spot DTW inherits the sleek casing design of the other Saber Spot models and also offers the same flexible scissor bracket. This locks into place by plastic thumbscrews located on either side, and can serve either as a floor stand or hanging bracket. The main body is constructed from tough molded plastic, while the scissor bracket is powder-coated metal. Weighing just 2.6 lbs. / 1.2 kgs. and measuring 3.5” x 6.75” x 3.5” / 88 x 170 x 87mm (LxWxH), the Saber Spot DTW is extremely compact and lightweight. In fact, the casing is so small that there isn’t room on the back panel for all the input and output connections. 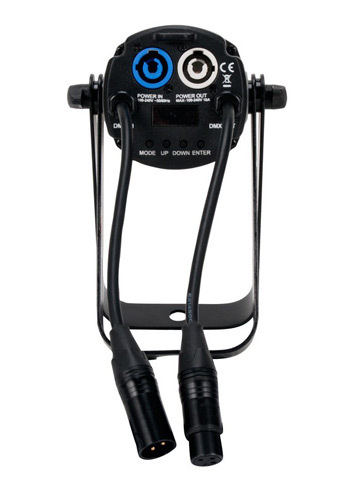 Therefore the 3-pin XLR input and output sockets are provided on short trailing cables. The unit’s on-board 4-button LCD menu display makes it easy to set up standalone operation, with 0-100% dimming, or address the fixture for DMX control. Three channel modes are supported (1, 2 and 4), allowing remote control of the fixture from any DMX512 hardware or software system. With its combination of a robust and compact case, powerful light-source and state-of-the-art ‘dim to warm’ technology, the Saber Spot DTW is a flexible spotlight fixture ideal for a wide variety of applications. If you want the authentic dimming effect of a halogen lamp but with all of the benefits of LED, look no further than this innovative new fixture.